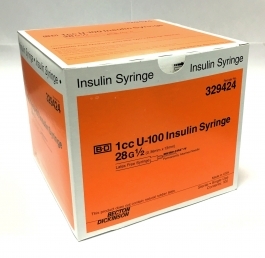 1 mL BD™ U-100 insulin syringe with 28 G x 1/2 in. self-contained BD Micro-Fine™ IV permanently attached needle, regular bevel, regular wall. Blister pack. BD's classic design for injection comfort, the BD Micro-Fine™ IV Needle is a 28-gauge, 12.7mm (1/2") syringe needle that has been trusted for years by people with diabetes.